There is a solution. 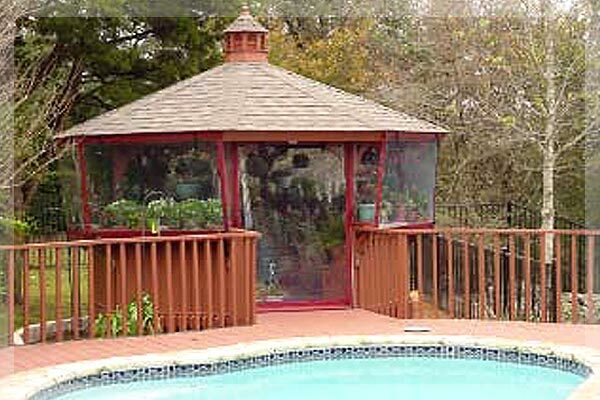 You can leave your beautiful plants outside on your covered patio, covered pergola, gazebo or other covered outdoor structure during the colder months this winter season. You don’t need to move your cars out of the garage as it becomes a temporary protection zone for your plants this winter. 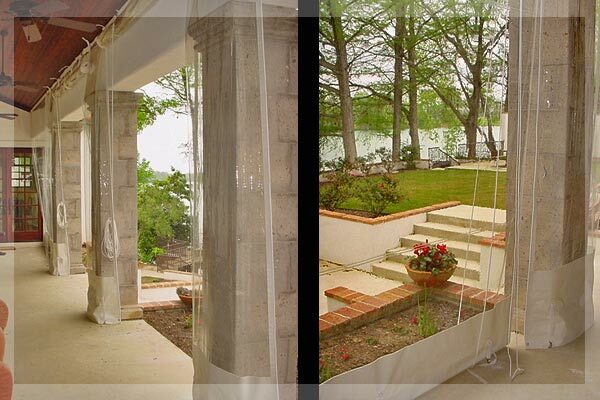 Archadeck of Austin is now providing weather curtains for your existing covered outdoor area. The weather curtains are professionally installed to hang from top to ground. They zip closed on the side to keep the whipping wind and cold elements away from your plants. Our weather curtains are a high quality weather curtain similar to the ones used in restaurants to protect furniture, block the cold/rain, and keep out flying insects while still being able to maintain and enjoy the view. These curtains will give you many years of year-round enjoyment and allow you to get the most out of your outdoor living space. You have two options on how to lower your shades. You can either have roll-down shades or a rope and pulley system. Clear View Curtains can be rolled up and hidden from view, drawn back on nice days to bring in the fresh air, or easily removed and stored. 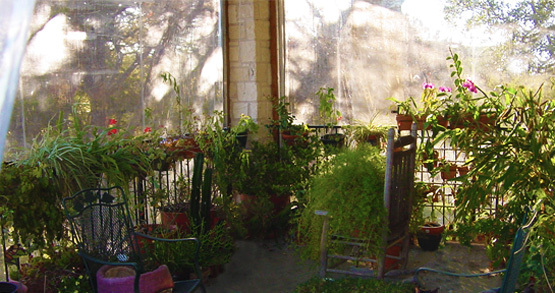 Enjoy your new outdoor living area year round, come rain or shine with the side benefit of protecting plants in the winter. You’ll still be able to enjoy the view from your covered outdoor area with your clear heavy duty vinyl shades. When we install your new weather curtains, we provide a cleaning kit for your new weather curtains. 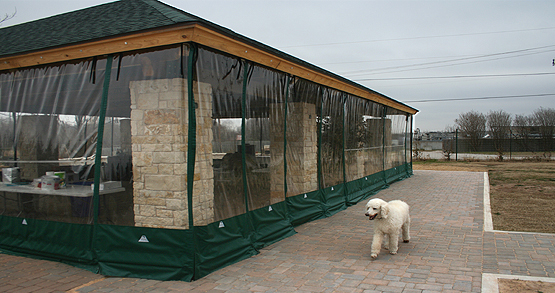 To enjoy your covered patio in the rain, in a bad buggy season or other times of year you might need wind, rain or bug protection, just roll down your weather curtains. All the curtains come with a 3-year warranty, 1 year on site repair/replacement, and 2 additional years repair if you pay freight. We also do commercial weather curtains for restaurants and other commercial applications. Give us a ring for more information or to have us come out for a free consultation. Or, request a free consultation using our easy online form. When you call, mention that you saw us on our blog. This entry was posted on December 8, 2010 by 33social. 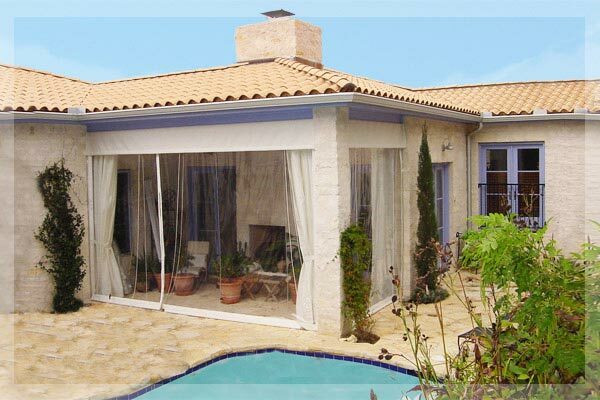 It was filed under Plant protection from cold, Protection from the elements, Sun shades, Weather curtains and was tagged with Austin sun shades, Austin weather curtains, Poly patio covers, Sun shades Austin, Vinyl patio covers, weather curtains, Weather curtains Austin.